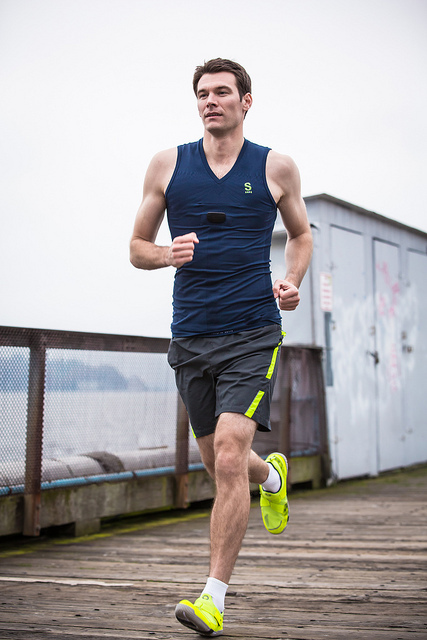 With that in mind at the Smart Fabrics Conference in San Francisco last week (April 2014), I caught up with Davide Vigano, CEO of Heapsylon to talk about their new Sensoria line of activity sensors. Sensoria’s knitted components (like Davide and his two co-founders) are Italian, leveraging a long-standing tradition of fashion knitwear. Although fitness trackers are becoming more and more a part of everyday life, Sensoria has combined some interesting features to offer something quite unique. Photo: Sensoria. Used with permission. Davide sees the Sensoria line as the next step towards an “ultra-personal computer” using an ecosystem of biometric sensors. At the conference, they showcased their sports bra and t-shirt, incorporating embedded textile sensor technology, but what Davide seemed the most excited about was their new smart sock. 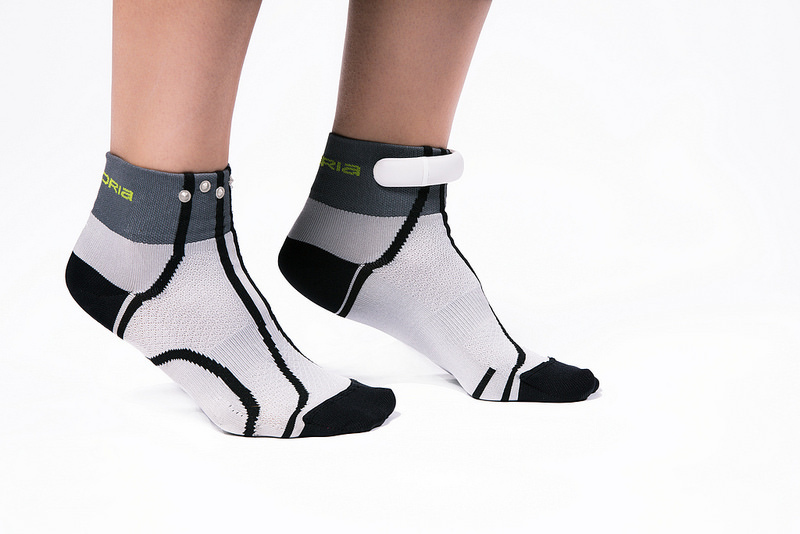 Using a custom sensor connected magnetically to an electronic anklet, the sock gathers data about your foot’s position and pressure and combines this data to calculate a variety of information, like balance, heel-strike, cadence (strides per minute), etc. Don’t think socks belong at the cutting edge? When the data from the sock is combined with additional readings from the sports bra or heart-rate monitoring t-shirt and crunched on your mobile phone, feedback can be more accurate and new inferences can be made about the wearer’s activity and condition. For example, a running specific app focusing on gait analysis is slated for release this week. It allows your phone to calculate your cadence (stride rate) and select a music track to match. But the real power in what Heapsylon is doing lies in their vision to provide their products, app and developer kit as ingredients to other brands. That way the technology can be re-worked by experts in fields ranging from salsa dancing to diabetes care with the focus on anything from fall-detection to sensory augmentation. For me this is particularly interesting, given that one of the criticisms of the Internet of Things has been that although the Things all speak to the Internet, for the most part they are not connected to each other. Sensoria’s family of devices is an elegant way to address this problem. Creators Project has created an incredible series of video interviews featuring designers, makers and thought leaders from the burgeoning wearable technology community. The series is part of Intel’s Make It Wearable challenge. Kicking off the Smart Fabrics Conference in San Francisco on April 23 is an E-Textiles Hack-A-Thon hosted by Sparkfun’s Dia Campbell and Pearce Melcher. 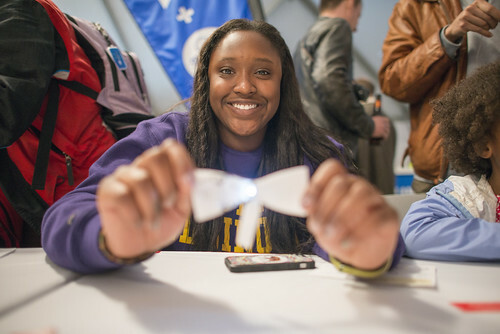 The workshop runs from 8am-12pm and looks like a great way to dive into wearable tech by getting your hands dirty. Curious to find out a bit more about the workshop and the ideas behind it, we caught up with Dia Campbell for a sneak preview. You’re likely to have a wide range of people attending the Smart Fabrics Hack-A-Thon, from textile experts to electrical engineers to interaction designers. Do you have any tricks for working with the diverse range of people who attend an event like this? Dia Campbell: Collaboration! Working with a group of people from a variety of backgrounds is far more interesting than working with a group of people who all know the same things. If you can encourage everyone to pool their skill resources, everyone ends up able to do so much more than they could have done on their own! And that’s where the real take-home value of a workshop like this is at. A project that you make in a day and take home has limited utility, but new skills, new tips and tricks, continue to benefit you in future projects. New collaborators, people you’ve had a chance to work with and get to know on a small project, can pay off indefinitely! Finding people with skills you need and value, and who can introduce you to new applications for your own skills, is the farthest-reaching investment of time and resources that I can think of. Your background is in costume design and fiber art. Can you tell us a little bit about that and how you ended up working with electronics? DC: Theatrical costuming, cosplay, and costume design have been a passion of mine for a very long time. The bulk of my theater work was done in school (there’s a tremendous time demand that is easy to meet as a student, and much more difficult to balance with full-time work! ), but I’ve continued to create costumes on my own time. 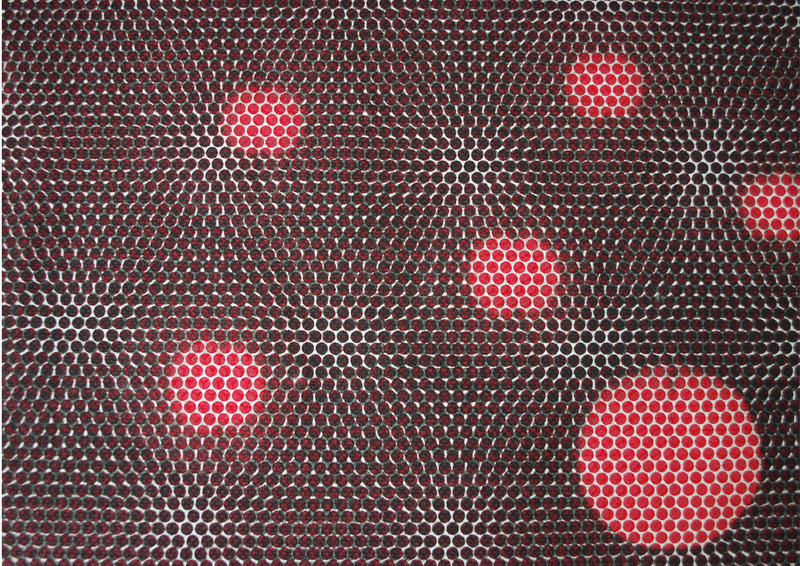 The discovery of e-textiles as a medium opened a great many creative doors, and I started working with sewable electronics in 2009. I’ve had to learn everything I know from the ground up, and I’m definitely still learning a great deal. I’m lucky to have had the opportunity to work with very talented educators and engineers, and to spend so much of my time discovering and experimenting with new materials. I hope that this workshop will be an opportunity to share that experience! Your title at Sparkfun is “TechStyle Specialist”. Did the role already exist at Sparkfun, or was it created especially for you? DC: The role did not already exist, but I think it might be an exaggeration to say that it was created for me. It was created in response to a need that I have been able, and very happy, to fulfill. What does a TechStyle Specialist do on an average workday? DC: I’m not sure there’s any such thing as an average workday! Every day contains at least a little bit of preparation for upcoming events. There’s a lot of work to be done pushing products and kits forward, a great deal of conversation with collaborators and educators in the community, and occasionally even a little bit of technical support for people getting started! On my favorite days, there’s either a hands-on workshop to teach or time to sit down and focus on making something interesting, useful, or beautiful. Sparkfun has a history of enabling and supporting e-textile experimentation, but they are primarily a hardware company. What’s it like working with their engineers when you come from such a different discipline? DC: It’s wonderful! I think a lot of my love for inter-disciplinary collaboration comes from the tremendous luck I’ve had, meeting and working with brilliant and creative people. The frustrations, in my opinion, are fewer and less painful than working in groups where everyone shares a background, because areas of expertise are so easy to define, and everyone isn’t trying to do the same job on top of each other! We respect each other’s competence a great deal. On the one hand, within a project everyone can feel like they are the master of their own domain. On the other, sometimes being a bit outside the field can provide surprising insights! 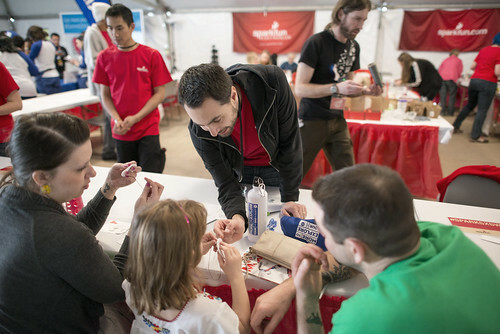 What has been your favorite project so far at Sparkfun? DC: I get so wrapped up in every new thing, that I feel like there’s no right way to answer this! On a grand over-arching scale, I’ve been working on a series of videos called ElectriCute, which I’m very proud of. It’s really important to me to showcase individual materials and make them approachable and understandable to newcomers, so ElectriCute is very close to my heart. Within that series, I think my current favorite episode project was a prosthetic illuminated tattoo we made to demo the Elastolite products we’re carrying. I loved the way it came out, and I’m really excited to use it in future projects! Finally, can you give us a sneak preview of the kinds of tools and materials people can expect to work with at the Hack-a-thon? Anything new from Sparkfun’s secret underground labs? DC: Everything I can get my hands on! I’m rounding up everything we sell, because it’s handy, but I’m also trying to bring in parts, materials and products that we don’t sell. I want people to see as huge a range of supplies as I can get into their hands, not pretend that the SparkFun catalog is where the buck stops, necessarily. There are a few new supplies that you’ll see coming up in our catalog, hopefully including at least one board still in prototype, but this is about the broader palette of available tools, collaboration, and learning by doing! Thanks, Dia, looking forward to the workshop! Perhaps you didn’t know it, but you’re most likely an admirer of Julia Koerner’s work. 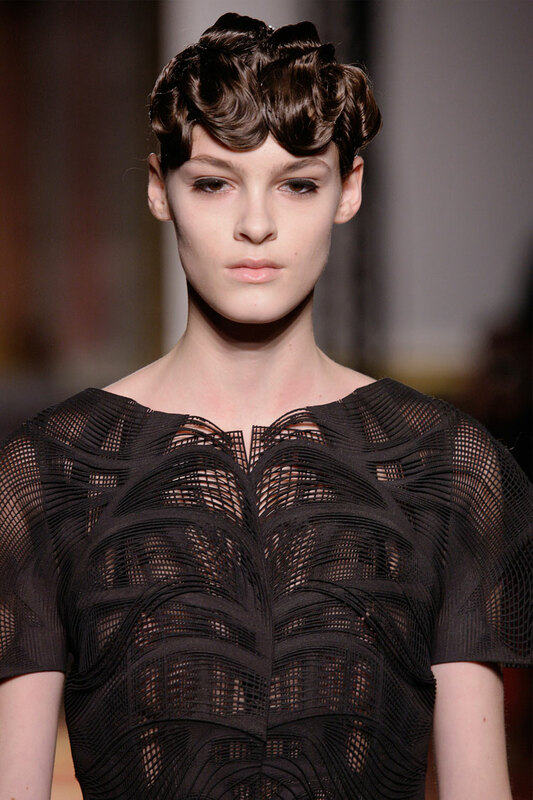 She’s the architect who collaborates with Iris van Herpen on many of her incredible 3D printed couture pieces. Julia will be speaking on the second day of the Smart Fabrics Conference in San Francisco, April 23-25, 2014. Julia was kind enough to take the time to answer a few questions for Fashioning Tech about her trail-blazing work at the intersection of fashion, architecture, the body and technology. Your work with Iris van Herpen has brought you to the attention of the fashion world, but you have an impressive portfolio of work ranging from fashion to interior design objects to buildings destined for space. What would you say is most challenging about moving between projects with such differences in scale and application? Do you have to do a “re-set” or are the basic principles the same? Julia Koerner: The basic principles in the design process are similar for me. Coco Chanel once said: “fashion is like architecture, just the scale is different”. I am very interested in cutting edge technology and no matter what scale I am designing in, digital fabrication techniques are always a drive in my ideas and designs. The constraints derive mainly from material science and computational limits, such as the processor of my computer. 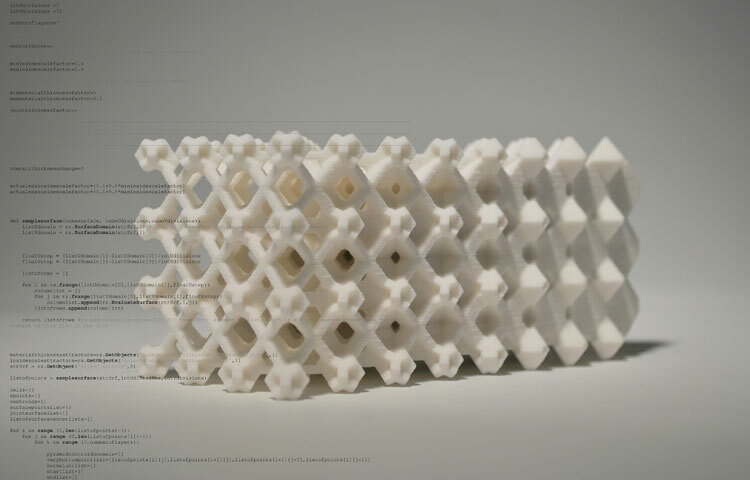 Additive manufacturing sets no limits in geometry and the complexity of a design has no cost limitation, which is the amazing thing. Textiles are integral to both clothing and building design, but we often mean different things when we talk about architectural textiles vs fashion textiles. Do you think that new technologies like 3D printing and new materials have helped to blur these lines? How far can we push the boundaries? JK: The ‘Voltage’ Jacket was produced with a new flexible material called TPU, which is stretchable and compressible in any direction. One can imagine it as a rubber or silicone similar material. The 3d printing technology used to produce the Jacket is called selective laser sintering (SLS) and allows us to print as thin as 0.8 mm. Since the material is non-rigid, the design had to be structural in order not to hang loose on the body. Three different structural layers are superimposed and intersect in different directions, the results are enigmatic effects which animate the contours of the body in different ways. I find it fascinating to speak about the structural logic of a garment’s design and find it interesting to design clothes with such an architectural approach. Ironically, a lot of ultra-high-tech design, like your work with Iris van Herpen, couldn’t be achieved without digital tools, but has an almost hyper-organic aesthetic. It is also often talked about with references to skin, cells and biology. What are your thoughts on this: is it accidental, reactionary, coincidental, something else? 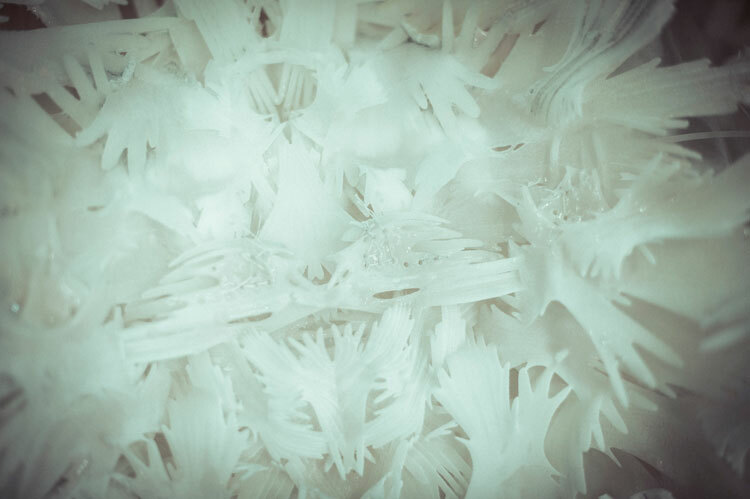 JK: The most recent additive manufactured piece I collaborated with Iris van Herpen on was presented on the 4th of March in Paris at her ready-to-wear Fall 2014 show named BIO PIRACY. In a statement Iris mentions: “the 3d printing collaboration with Julia Koerner fuses the artisanal with the technical to create a kinetic dress which dances as it amplifies bodily movement”. 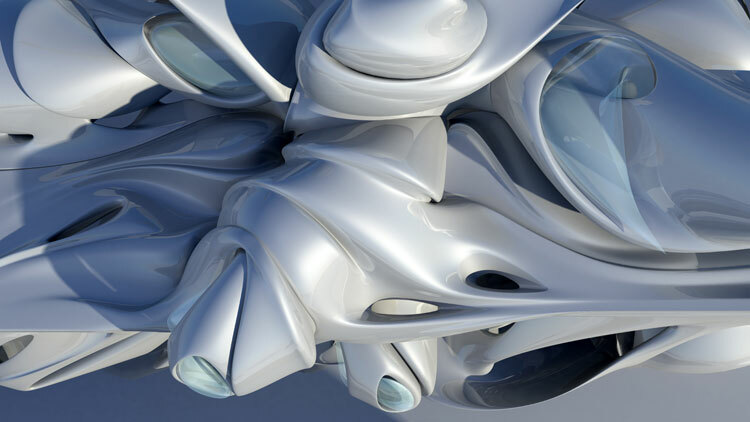 Almost all of my designs I create are inspired by forms and shapes I see in nature – the purity of optimized form, complexity in geometry and symmetry are intriguing components I work with when I recreate specific mathematical codes on the computer. I notice that referrals to prosthetics pop up now and then in your work. Is this something that you’re interested in exploring in a more literal sense (i.e., artificial limb design) or just a general source of inspiration? JK: My final Master Thesis at the University of applied arts was a design for a Biomechatronic research center to be located at Manhattan, NY. “Super Human Enticement” is a project meant to create new spaces with enigmatic spatial effects inside the urban fabric of a metropolis. 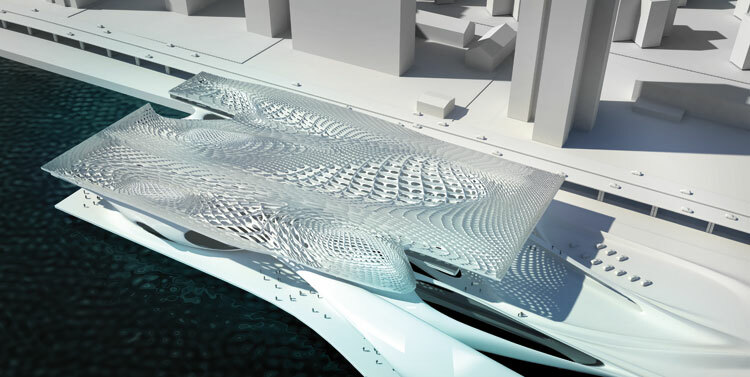 The fictive building is designed to inherit a combination of sports field and recreating, health care and showcasing high end customized artificial body parts. I am consistently intrigued by the paradigm change lead by Amy Mullins and other leading figures in this field. I believe that there is a certain beauty in the skeleton of the human body and the performance of the cellular system of bones is an incredible biological phenomenon I am inspired by in terms of my architectural/structural research. My dissertation at the Architectural Association in London was based on the research into cellular complex systems in nature and we developed mathematical codes to design architectural structural building components which are based on the geometrical logic of such systems from nature. We hear a lot about interdisciplinary collaboration these days. You’ve collaborated with fashion designers, architects and engineers. What would be your dream creative partnership? JK: I am a Lecturer at UCLA at the MARCH II graduate program and we work a lot with other industries such as currently we collaborate with BOEING. I find it very interesting to bridge between different fields and one industry I am extremely interested is the sports clothing industry. I like that they challenge cutting edge material science and technology and I feel I would love to contribute with my ideas. You’ll be speaking at the Smart Fabrics Conference in San Francisco in April. Do you plan to go into depth on your body/fashion-related projects, or will it be more of an overview relating to ‘fabrics’ in broad terms? Or something completely different? JK: I am excited that I am invited to speak at the Smart Fabrics conference and I intend to mainly speak in-depth about my work with fashion design and how it relates to technology and architecture. Thanks so much, Julia, can’t wait to see your talk at Smart Fabrics! Clothing Plus CEO, Akseli Reho, will be speaking on the first day of the Smart Fabrics Conference in San Francisco, April 23-25 2014. Fashioning Tech readers can get $100 discount to the Smart Fabrics Conference with the code FTECH. If you’re not familiar with Clothing Plus’s products, you are missing out – they produce beautifully-manufactured clothing for partner companies, mainly from the sports and medical fields. Cleverly-placed sensors integrated into the very fabric of the garment and body-friendly, flat laminated seams are the hallmarks of Clothing Plus. 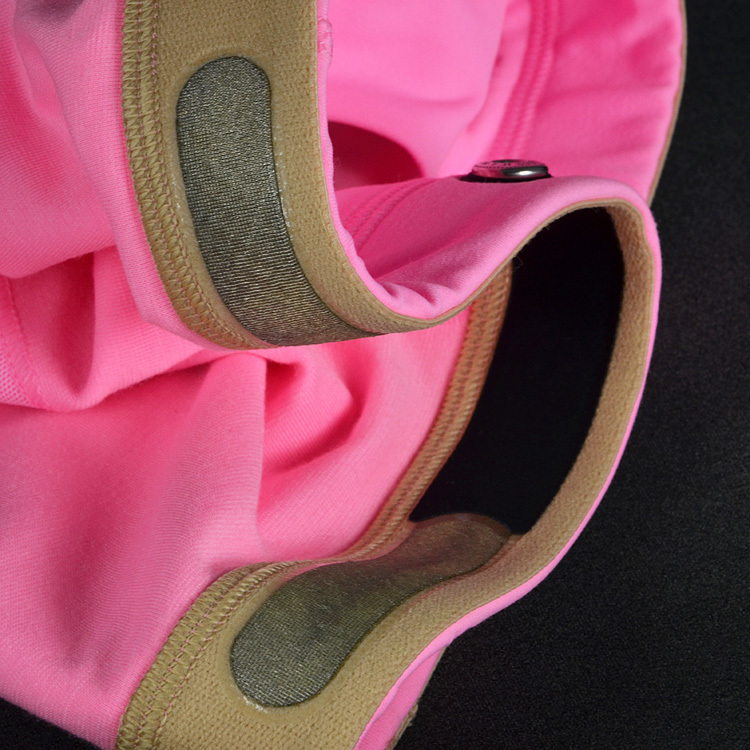 Lululemon All*Sports HRM Bra onto which Clothing+ has integrated the heart rate sensors. Photo: Clothing+, used with permission. Can you tell us a little bit about your background and expertise and what drew you to smart textiles? 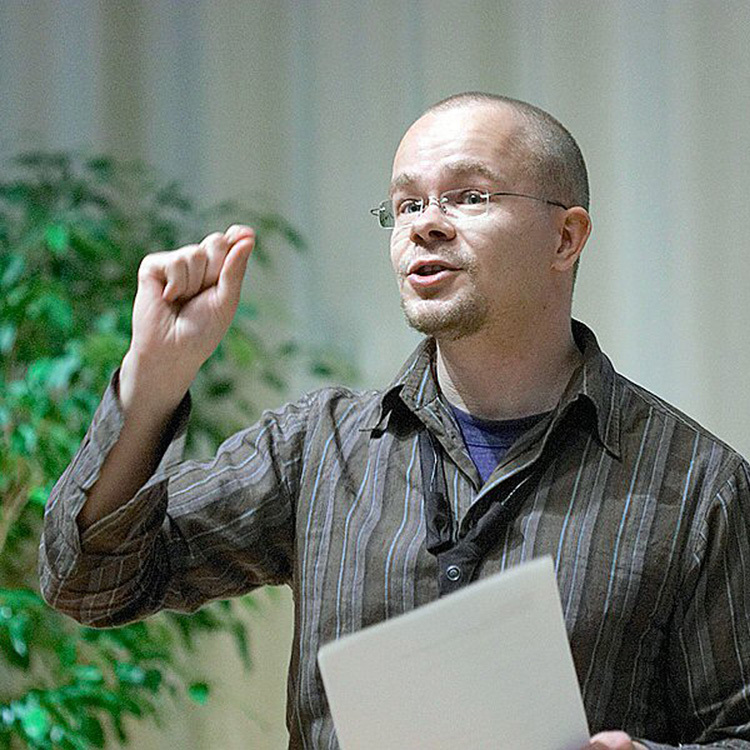 Akseli Reho: I have a master’s degree in telecommunication and I have always been very interested in problem solving. I did some work for a Finnish outerwear manufacturer called Reima when finishing my thesis in 1997. When Reima wanted to venture into smart clothing the following year I was called onboard to run the project. This led to a joint project between Reima and two Finnish universities and the outcome of the project, a fully functional prototype of an arctic survival suit, was so good that Reima decided to dig deeper and see if wearable technology and smart clothes could become a new product category for them. Clothing+, a research center for wearable technology was established in March 2000 and that foundation later evolved into the independent enterprise Clothing+ Ltd is today. Adidas MiCoach Elite HR Shirt for soccer players. Textile sensors monitor the player’s heart rate and an electronics pod in the neck also measures acceleration and GPS. Data is sent to the coach’s iPad app which shows how each player is exercising, what their energy level is, if they’re improving and how well they’ve recovered from the previous training. Photo: Clothing+, used with permission. 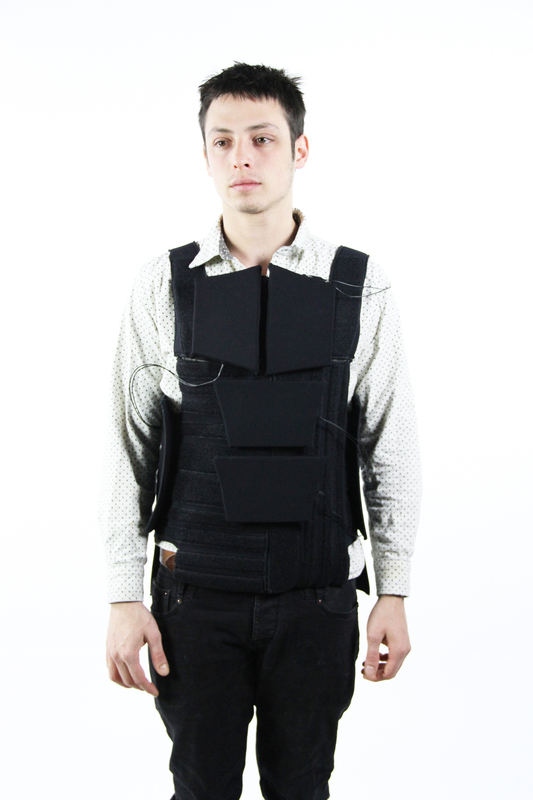 Clothing+ created a heart rate sensing shirt as early as 1998. Was the company formed around that product and how did development start? 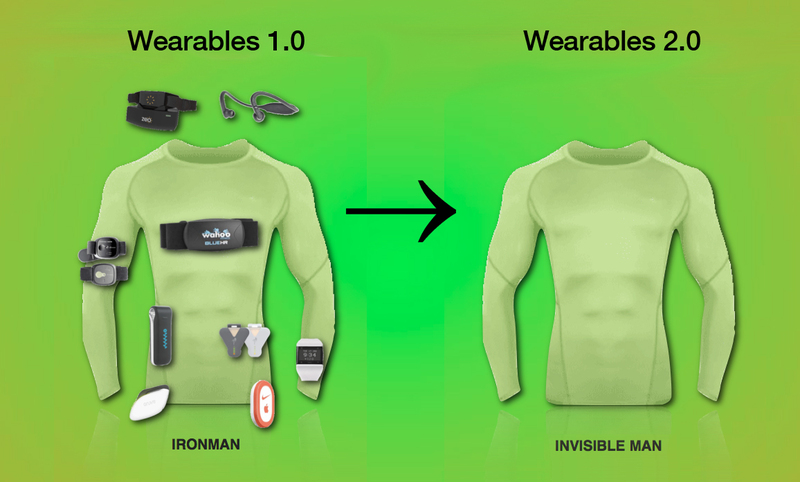 AR: The world’s first fully functional heart rate sensor shirt was indeed created for the Cyberia survival suit. It had a snug-fitting long-sleeve top with a tight rib mesh band around the chest, where sensor patches were embroidered with conductive yarn. We took the transmitter from Polar’s heart rate monitor for horses, snapped it on and the shirt worked perfectly! Later we would lift various inventions from that suit to productize them. Heart rate monitoring was pretty obvious as it would so clearly benefit from garment integration with the sensors needing skin contact. In 2002 Clothing+ and Polar launched the Polar Wearlink, the world’s first textile heart rate sensor strap. In the beginning we didn’t really know how this new product would do in the market. 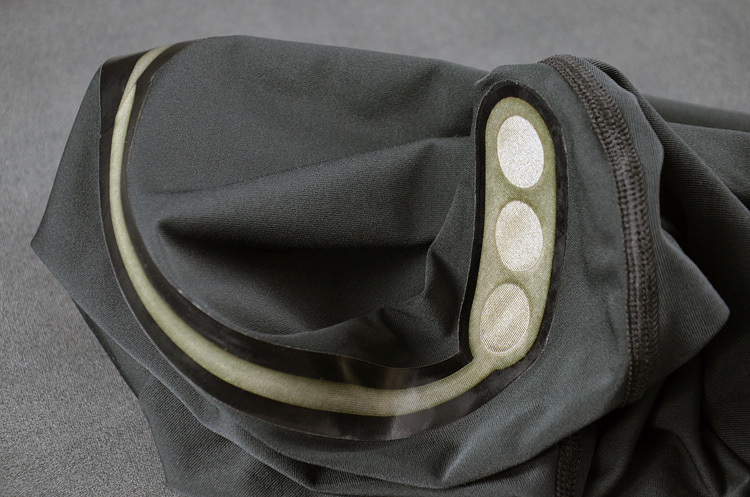 We half expected it to be received as a gimmicky fad, but it took off very quickly and we realized comfort is one of the key things textile-integration can improve over existing biometric sensors. With the success of the first product we centered our operation on biometric sensing. I’m impressed by the beautiful construction techniques used in Clothing+ products. You use a lamination technique that results in a very flat and comfortable-looking seam. Can you talk a little bit about the challenges you faced when developing this method? AR: Our first products were constructed with traditional techniques; cutting and sewing. We soon learned that seams, edges and basically any sharp or hard spot on a product used on bare skin would become abrasive when used in a repetitive motion over a period of more than about two hours, such as long-distance running. This led us to try to develop the comfort-factor further so we turned to laser cutting, assembly by lamination or ultra-sonic welding and careful selection of materials that enabled us to make flatter, smoother surfaces. This is textile technology shaking hands with industrial design in mass-production! 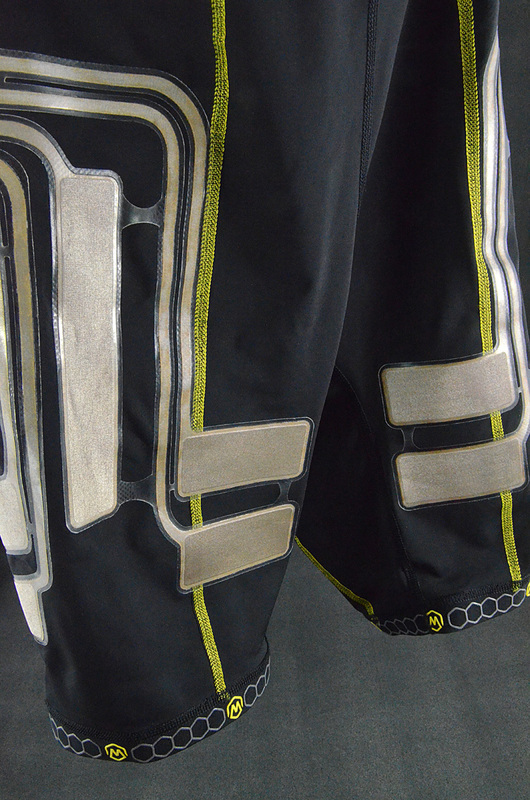 M-Body EMG Pants turned inside out to make the sensors visible. The pants measure muscle activity and with the help of an app, an athlete can tell exactly how much weight they’re placing on either leg and if they’re leaning forward or backward. This technology is, of course, machine-washable. Photo: Clothing+, used with permission. You work a lot with big tech innovators like Philips, Garmin, Adidas, etc, in the health and fitness markets. Do you have any collaborations with fashion houses that you can tell us about? What are your general feelings about fashion merging with bio-sensing tech? AR: Almost all product development Clothing+ does is commissioned customer projects. The design is mostly very technically oriented and adheres to the old but ever-relevant “form follows function”. Possibly due to the challenges in creating accurate and reliable, mass-production-ready textile-integrated sensors our customers haven’t so far wanted to introduce design as a driving element and have been happy with just getting good data with Clothing+ sensors. This is likely about to change. While we see that the high quality of our products is not threatened by rivals any time soon, we firmly believe products need to be desirable in appearance as much or even more than technical novelties to make mass market. Clothing+’s vision is to make sensors disappear. We are working towards making sensors disappear not only visibly, but also in feel, logistics, accessibility and ultimately in price to lower the threshold for a manufacturer to take on textile-integrated sensors beyond significance. From this perspective the fashion-side of things is largely related to the carrier garment while our sensors become less and less noticeable. This is a bit of a wild-card question, but: what is the weirdest thing Clothing+ was ever asked to develop (even if it didn’t make it into R&D)? AR: After we published the one-off Cyberia survival suit prototype at the Hannover World Expo in 2000 we received a number of contacts from dubious military contacts from countries with hard-to-pronounce names. Many wanted to buy hundreds of suits without even asking for the price! We never even built a second prototype… The first wave of wearable technology in the first years of the 2000’s washed out the most impractical or non-viable ideas and many companies died off. Second wave companies are clearly more cautious in approach. The things we’re asked to make these days are very practical and good ideas as a rule. Akseli Reho, CEO of Clothing+, possibly talking about how thin their sensors are. Photo: Clothing+, used with permission. You’ll be speaking at the Smart Fabrics Conference in San Francisco in April. Can we expect any big announcements from Clothing+? Any exciting projects in the pipeline that you’re free to talk about? AR: Clothing+ is launching a number of new products with big brands in both sports underwear and the medical segment later this year. Although none of them will debut before the April Smart Fabrics, my talk will give you a deeper insight into the world of Clothing Plus, so there is sure to be something you never expected. Thanks, Clothing+, for taking the time to answer our questions! From her studies at the Swedish School of Textiles in Borås to Professor of Fashion Design at Universidad de Monterrey, Mexico, Marta Kisand’s work in smart textiles spans not only many fields, but many countries. She has designed shoes, surfaces, clothing and car interiors – all show her signature graphic style and all are “smart” in more ways than one. Can you tell us a little bit about your education at the Swedish School of Textiles and why you chose that path? Marta Kisand: After graduating from my BA studies in Textile Design at the Estonian Academy of Arts I had to take a rather difficult decision. When I started my studies we still had several textile companies and some textile production in Estonia but by the time I graduated, the majority of the textile industry had either disappeared or moved elsewhere. I realized the difficulty of continuing as a professional textile designer, also most of my group-mates continued their education in other design fields. I had to decide whether to change my career direction or stay in the textile field. I liked textile design a lot and I did not want to throw away everything I had learned so far and therefore I decided to give textile design another chance, but to add another dimension to it, which was the field of smart textiles. Without really knowing much about it (at that time I had only done one LED-embroidery workshop in Estonia) I decided to take a risk and continue my studies at the Swedish School of Textiles. I had heard that this university is one of the few places in Europe where you can work with smart textiles. I was accepted into the MA program and suddenly I was sunken into the field of smart textiles. I spent my first year of study learning about smart materials as much as possible. In Borås we were lucky to have many researchers and guest designers doing workshops and teaching us how to work with Arduino, how to print with thermo chromic inks, how to make textile buttons, how to solder and how to make sensors etc. It opened up a completely new world for me and I could combine my previous textile skills and knowledge with electronics and technology. I had to learn a lot and start from the very beginning – for example: how to create an electrical circuit? I am very grateful for this experience and glad that I continued with textiles. I really like the “Integrity” fashion collection you designed together with Anna Lidström, Eleonor Johansson and Katja Schmitz exploring behavioral communication in urban environments. Can you briefly describe the inspiration and design process, how long it took, etc? Also, what was the general reaction from people when the pieces were worn in public? MK: The “Integrity” project was a collaboration between design and management students at the Swedish School of Textiles which we had for one semester. (Design: Marta Kisand and Anna Lidström. Management: Eleonor Johansson, Katja Schmitz). We were exploring the crowded urban environment and created a collection of wearables which helped the wearer either to escape the surroundings or to connect with other people. As people relate differently to crowdedness – some love it and some hate it – we wanted to explore the possible design solutions which would help to deal with the crowded environment. We worked with air-proof materials and created inflatable accessories. Black Air Dress has a huge inflatable collar which can be inflated into a huge shape which creates personal space for the wearer. 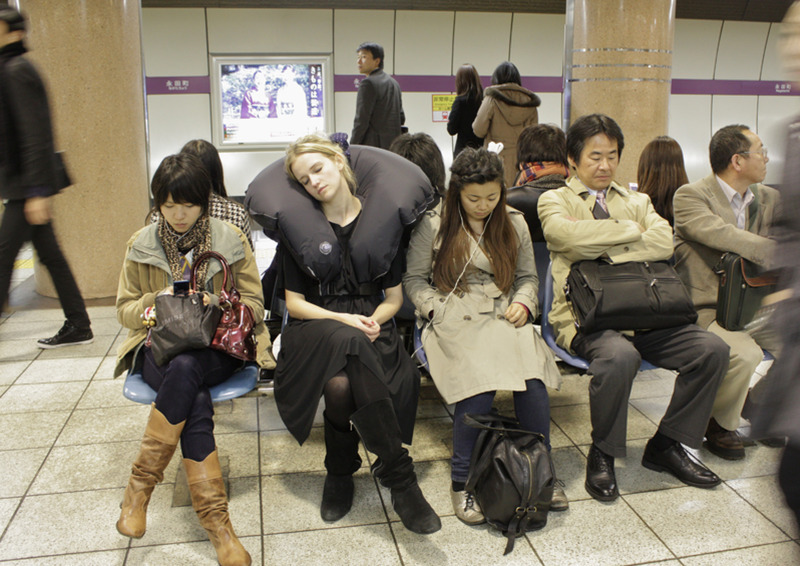 The wearer can lean on it and have a nap. We thought about very practical aspects of urban life and the necessity to calm down and have a rest in busy urban environments. The Air Pants for example have a belt which can be inflated so that a seat is created. The wearer can sit and take a break when necessary. The Bookshelf Dress is for a person who wants to escape their crowded surroundings. The wearer can lift up the skirt and a large bookshelf appears. The wearer can hide himself/herself behind the bookshelf. On the other hand, some people like crowds and want to make a connection with others. Sometimes it is difficult to find a reason to talk to complete strangers. 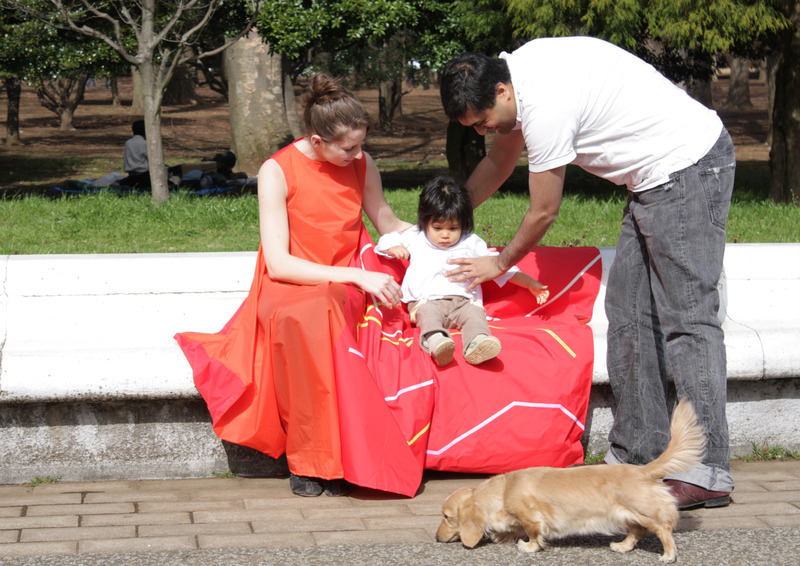 We made the Thermochromic Dress which has a huge skirt and can be shared with other people. It is possible to invite others to sit on it. The dress is printed with inks which react to heat and change color when someone sits on it. This is a good reason to start a conversation and talk about the color change. This is a way to make a connection. We also traveled to Tokyo – to one of the most crowded cities in the world where we could test and try our collection in the public space. For me it was a very exciting part of the project when we could actually put the products into action and see how it works in reality. We documented our designs in all possible crowded situations and thereafter we had an exhibition in a small gallery in Roppongi, Tokyo. We presented our garments and also documentation of the project. We made questionnaires for the opening night and received feedback from Japanese people who live in this crowded environment. The feedback was very different: some people don’t like crowdedness, some are fine with it, some don’t really care and some could not really understand what was the project about. This illustrates well that people do relate very differently to crowdedness and one-solution-fits-all is not really an option. More recently you’ve been working with textiles for auto-interiors. This must bring a completely new set of both possibilities and restrictions. What were the main design opportunities and restraints you discovered while working on your Masters Thesis for Volvo Technology and Sustainable Vehicle 2020 for Toyota? Do you think that the auto industry will drive developments in smart textiles? MK: That’s true, the automotive field is very restricted by laws and regulations but at the same time every car producer is interested in innovation. Therefore the industry is investing a lot into research and development. Many projects never reach production for different reasons but despite that the automotive industry is always looking for new innovative ideas. My MA thesis together with Volvo Technology in Sweden was about finding the possibilities for smart textile use in the automotive industry. There are many smart materials and technologies developed and available but not much of it has entered production. I was investigating the possible smart solutions for truck interiors which would help the driver to work and also spend leisure time in the cab. I was working with color change (thermo chromic) inks and light materials (LEDs and EL-wire). 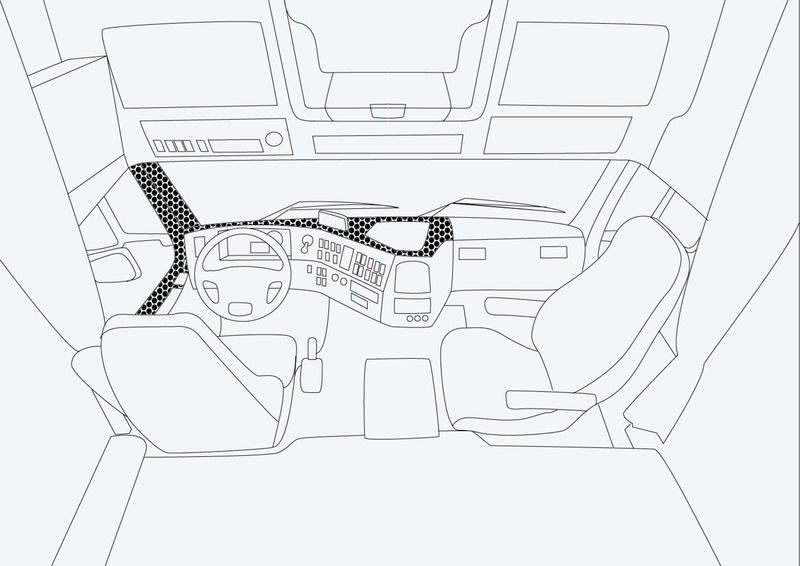 I created textile interfaces which communicated information to the driver and textiles which added comfort value into the small cab environment. After graduation I travelled to Japan where I made an internship at Toyota Boshoku. I was working on a small city-car interior and created an illuminating textile for a headliner. I was able to produce smart textile materials at their factory on industrial weaving machines. This experience proved that it is possible to mass produce smart materials. For me, working with very small car interiors is a very interesting topic. This also relates to the crowdedness theme which was explored in the “Integrity” project. Clever design solutions can add value to small restricted spaces. Textiles are materials which can have very different characteristics, it can be stretchy of stiff, thin or thick, plain or structured etc. And it can have all of those characteristics in one material. Using those qualities it is possible to create both functional and aesthetic solutions which fit in the small environment and at the same time take very little space. In the end, a big part of the car interior is covered with textiles (seats, floor, headliner, doors etc) and there are endless possibilities in playing around with the characteristics of textile materials. I think there is interest in smart textile solutions for the car industry. One important aspect of it is the component and weight reduction issue which can be achieved with smart textiles. 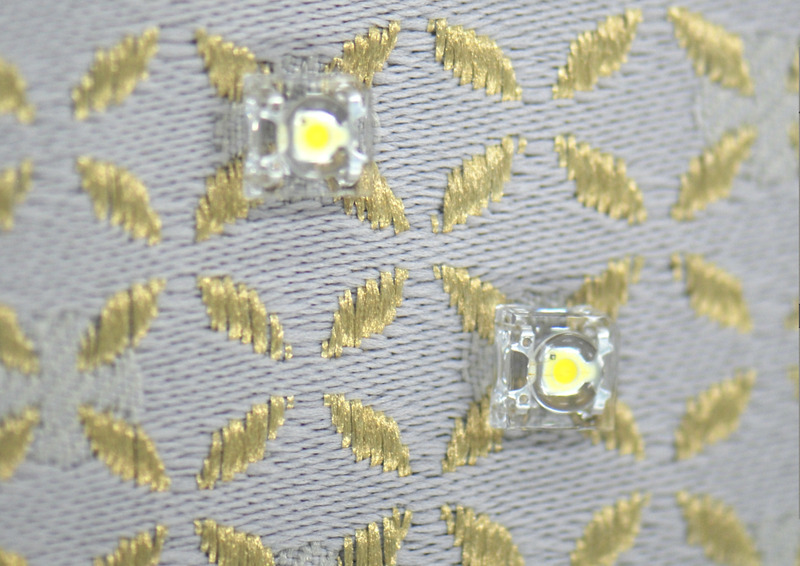 Electronic components woven into textiles make the material lightweight and different components merged into one material makes it easy to handle. I believe we will see more and more smart textiles not only in the automotive field but in other fields as well. Lastly, are you working on anything currently that you can tell us about, or do you have any plans for new projects in the pipeline? MK: At the moment I am settling down in my new hometown, Frankfurt in Germany and working as a color and trim designer at Opel. I will definitely update my webpage about my new projects. So stay tuned! Wesley Chau‘s recent project Drop the Beat is a performative garment exploring rhythm and sound through physical interaction. It is inspired by Laurie Anderson’s 1986 concert film Home of the Brave. I’m a Toronto-native who studied visual art in a regional arts program during high school. After, I attended the Rhode Island School of Design and discovered a passion for the overlap between design and art. I am currently completing my last year in the Industrial Design program at RISD. 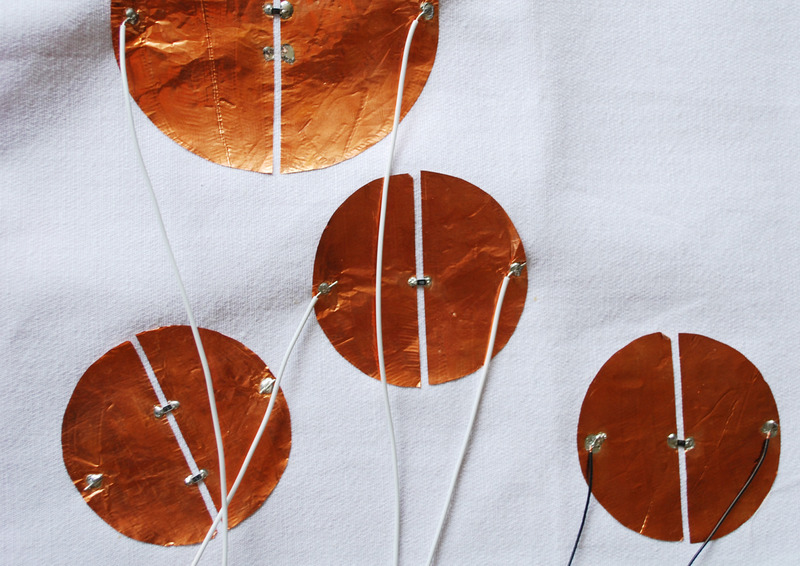 Is Drop the Beat your first experiment with wearable technology? Yes, and it won’t be my last! Can you tell me a bit about your process and development behind Drop the Beat? Drop the Beat was a final project for a collaborative studio at RISD called Digital Body: Hybrid Adornment. The six-week class was an intense crash course on basic flat-pattern making techniques and computational design. As a drummer in high school and an admirer of performance art (in this case, Laurie Anderson’s Home of the Brave), I wanted to create a customizable garment that could elevate the stage presence of digital musicians/DJs. What is Drop the Beat technically comprised of? Drop the Beat technically involves four piezo sensors embedded in neoprene drum pads. They are then connected to an Arduino to send a serial to MIDI message to the audio software (in this case, Garageband). All of the electronics are attached with Velcro to the neoprene vest. Where and how do you envision Drop the Beat being used? I see this piece being used not only in live concert situations but also in collaborative dance/performance work. It would be exciting to see it translate into different scales. Is the medium, wearable technology one you plan on re visiting? Definitely! I think this field is on the cusp of wide expansion and acceptance. I can’t wait to see where it takes us next. And lastly, how do you see the product evolving? What is version 2.0? I would love to see the product adopt WIFI features. The design definitely loses refinement with wire and USB cables in the way. Back to the drawing board! Here is a video documenting the project and the relationship between rhythm and sound. Nancy Tilbury, director of haute tech StudioXO, has been a true pioneer and visionary in the field of wearable technology and interactive fashion. 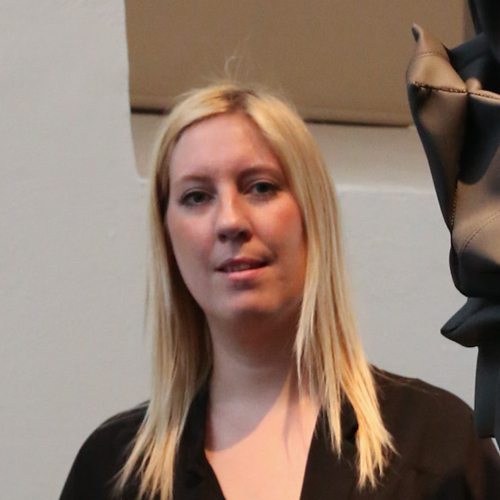 Her conceptual work in wearable tech was honed at Philips as she was a team member of the Philips ‘Intelligent Fibers Team’ and Philips Design Probes. Like a true futurist, Tilbury continues to imagine what our future wardrobes will look like while creating beautiful, interactive wearables today. 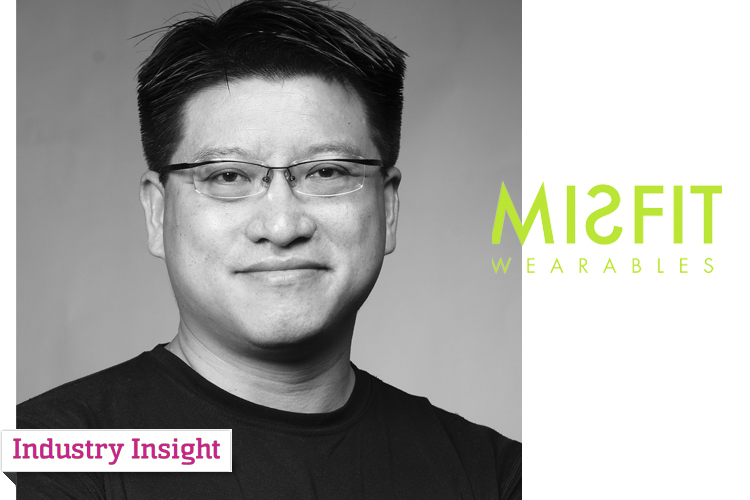 I had the pleasure of meeting Sonny Vu, CEO of Misfit Wearables, this past spring at the Smart Fabrics conference. Among the highlights of the conference was his talk “From Fittech to Medtech, The Possibilities of Smart Fabrics” that presented an overview of current wearable tech products and insight on how to bring medical products to market. (1) Wearable tech garments shouldn’t have to be remembered to be worn and (2) they should have functionality other than sensing. In other words, Vu seems to be advocating for the technology to become invisible and the wearable product to be recognized first and foremost as a garment rather than a gadget. At the University of Southern California’s sixth annual Body Computing Conference in Los Angeles this month, Sonny Vu announced that Misfit Wearables will debut their products mid-november. Pre-orders will likely happen initially through Kickstarter. In anticipation, I had the pleasure of interviewing Sonny Vu to gain further insight on what role he envisions wearables playing in the health and wellness industry. A combination of an aging population and an increase in chronic disease has dramatically increased health costs. How can wearable health monitoring systems be used to reduce escalating health costs? SV: If people actually use these products, we will not only have more data, but also better quality data. It’s better because it doesn’t require user intention to gather and can be used to enable or enhance many applications. The most obvious ones are clinical and consumer decision support, remote patient diagnostics and monitoring, emergency detection and response, health behavior insight generation, and possibly even compliance/adherence monitoring. In your “Whose Lives Could Mobile Health Improve” infographic it becomes clear that “mobile health” is predominately targeted at the management of chronic disease such as diabetes and obesity. Since prevention and management of most chronic diseases is about encouraging lifestyle changes, how can wearable technology be used to ultimately change human behavior? 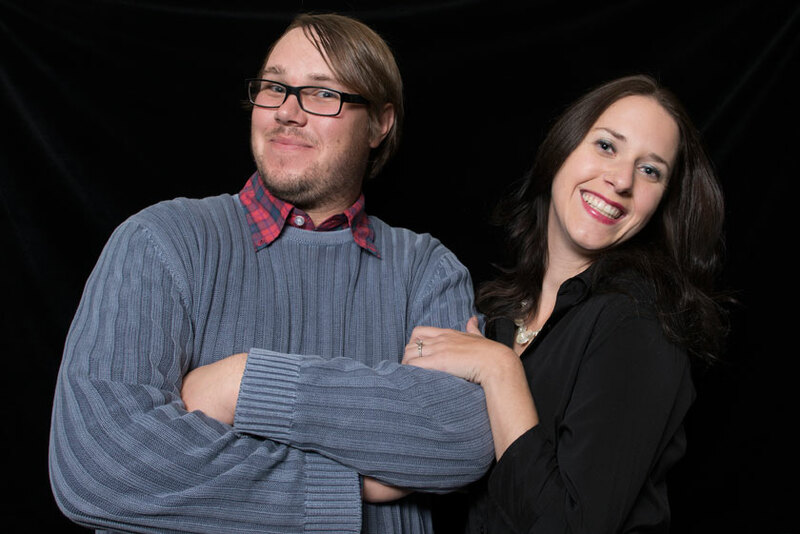 SV: I’m no BJ Fogg when it comes to understanding how to help people modify their behaviors. Probably one of the most important things wearables can do is to make people much more aware of changes in their health condition and to give them instant feedback (assuming they have the relevant actuators). This can motivate them to take actions that lead to small wins, and towards a positive change. Next, wearables, when done well, can provide data and insights that may only come from ambient, “unintentional” sensing. Finally, I think a good complete wearable experience can be designed to modify negative health habits by facilitating changes in routines (cf. my favorite read, Charles Duhigg’s The Power of Habit). This of course presupposes that really useful services and meaningful insights are provided to the user in conjunction with the use of wearables. The”Health Devices at a Glance” infographic alludes to the desire of physicians to have patients monitor everything from their blood sugar levels to sleep patterns. Do you feel a patient’s active participation in monitoring their health can lead to a better understanding of their bodies and habits? SV: Not really, because I don’t think people generally like to actively participate in monitoring their health. I think people generally prefer to have the monitoring done passively. For the small segment of early adopters, high-concern users, their active participation will of course help. But even for them such participation is difficult to maintain over time unless they get some real value out of it unless it’s already embedded in a habit. In what ways do you feel wearable health monitoring/diagnostic systems will change our day to day lives? SV: Two ways, provided that it is done well. First we can hope for more genuinely “wearable” products, so people will not have to carry everything around (stress monitors, glucose meters, pedometers, heart rate straps, etc..). Secondly, we will gain a host of insights that may have been difficult to attain without data acquired ambiently — the user forgetting that data was being collected. Currently what technical obstacles do you see that diminish the user experience in current wearable technology products? Is wearable technology really wearable yet? •Recharging – you don’t have to recharge your clothes now, so why should you have to recharge wearable stuff? It would be nice to not have to recharge all the time, though I don’t think users would mind replacing batteries once or twice a year. • Requiring skin contact – I kind of like my t-shirt hanging off my body and not wearing compression shirts all the time; it would be nice if this requirement didn’t exist. • Washability – I guess it’s not that hard to protect stuff when you’re washing it (though heat drying might be another matter), but I haven’t seen too many instances of wearables that can be washed (a lot) and are not bulky. • Affordability – anyone who’s done a consumer product knows that consumers are generally very price sensitive. So how do you make this stuff, say a sensor-embedded t-shirt or something, only slightly more expensive than a regular t-shirt? There seems to be plenty of examples of cool prototypes and high-end wearable products out there but how many have actually been / can be designed for low-cost manufacturing on a massive scale? How is designing wearable technology systems different than designing medical devices? SV: There’s lots to talk about here so let me just focus on one aspect that’s probably on many people’s minds: a product becomes a medical device in need of regulatory clearance (at least in the US and the EU) when it has medical claims associated with it. To get clearance for commercial sale, you basically have to be able to support these claims in regulatory filings you’d have to do for you product. To do so you will need, among other things, a quality system that specifies how you develop and test products, document your work and deal with issues that arise, etc. This system has to be more formal/ rigorous than the equivalent for a non medical consumer electronic device. Then you have to demonstrate that you comply with the system. None of this is all that “difficult” but there are probably more infrastructure, process/procedures, etc. than you might normally require if you weren’t developing a medical device. What role does “design research” and/or ethnographic research play in your process? How do you learn about the needs of your end users and their behaviors? SV: Gosh there are many schools of thought here – at Misfit, we believe as Steve Job’s would say that it’s not the customer’s role to know what they want. At the start of our design process, we begin with thinking about what people do already and try to figure out ways to insert useful products and services into those activities. As for wearables, we think about what people already wear, how they wear it, what they do with it, etc. Then we see if we can fit sensors, etc. into those things as invisibly as possible, without asking them to do anything they wouldn’t already normally do. This is in contradiction to an approach say where you get the sensors you can already make and assume people won’t mind strapping them on. What can you learn/co-opt from the fashion design and manufacturing process? What are the non-technical challenges in prototyping and bringing to market wearable technology products? SV: Stuff just never fits or feels as comfortable as you think it might so as mentioned above, iterate as much as you can afford to. Inventory control can also be a nightmare, especially if you have multiple models. Models x sizes x version upgrades = lots of SKUs! It’ll serve a group/company well to have a great supply chain management resource or partner! Lastly, on a personal note, do you monitor/track your own physiological data? SV: For sure, although I try not to be too obsessive about it. I’ve been testing my blood glucose fairly regularly (nearly daily) on an episodic and sometimes a continuous basis for almost a decade now. I also monitor weight, activity, and occasionally, happiness. To learn more about Misfit Wearables or enjoy more of their lovely infographics, visit misfitwearables.com. “DENZIPFADEN” is a baroquely embellished garment, which utilizes zippers as an interactive platform through which to DJ. It was develop in collaboration with the electronic music composer Beorn”Newk” Lebenstedt, as a new platform for musical expression. In an increasingly intangible musical landscape were music is made on laptops, from digital sound samples, and through built-in computational effects and filters—it is quite another dimension to create new tangible hardware to manipulate sound. 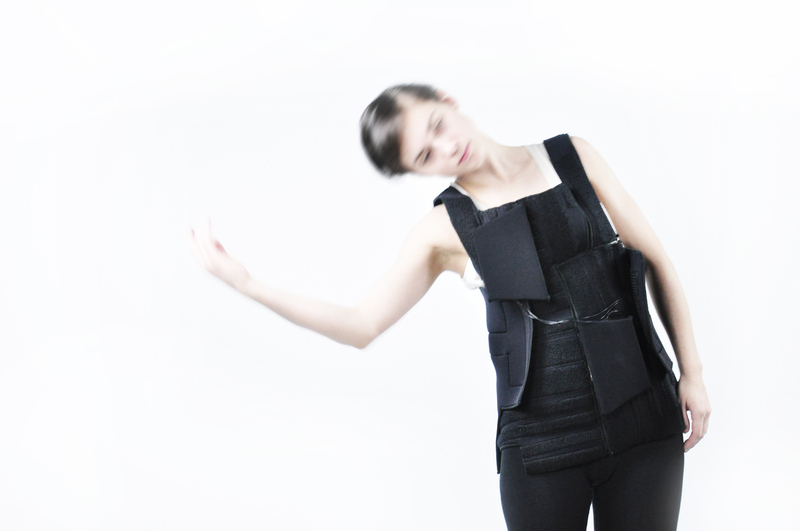 Bringing us back to the physical instrumentation of sound through the manipulation of materials, the zippers on this garment function as body-clad switches, taking us closer to an instrumentation via embodied musical interaction. I studied fashion at the Artez Art-academy, in Arnhem the Netherlands. Q: What led you to your being involved in fashion and technology? I’m not so much a designer who is looks back in time for inspiration, but more towards the future. For me fashion is a platform to translate your most extreme thoughts, and ideas into a sculptural/design piece or collection. So I think fashion and technology are a great combination because everything is possible. In my work the use of special materials is a big part of the design process and end result. This is how I worked, for instance, on the fashion and technology project ‘Intimacy.’ For me, this was a great way of combining a interesting materials, sculptural parts, handcrafted details, and technology. After this experience, I was inspired to do more fashion and technology projects like the “DENZIPFADEN” outfit. Q: What kinds of materials and technologies are used and integrated into your designs? Could you describe the process / challenges / advantages of using these particular materials in fashion and garments? I’m very inspired by electronic music and my partner Beorn lebenstedt is a electronic composer. So every day I get inspired by great music/sounds, and a music/ fashion cooperation was a logical step for us to make and that is when we created the DENZIPFADEN ouftit! Beorn (aka NEWK) started by the idea that zippers could be function as a midi controller. Q: What does technology add to fashion? The biggest thing that technology adds for me is amazing collaborations. To work with people from other (art) disciplines is a big inspiration!! I’m not a very technical person, and I sometimes have ideas that are just not possible without people who are technical. For me technology is a source of possibilities. Q: If you could have anyone alive or dead wearing your fashion-tech design, whom would you pick, and where would they be? I think that it is a pity we live in a time where famous people wearing your fashion pieces is so very important. It’s almost to the extreme that if no one does wear it, you do not exist as a designer… Of course, we all want to be recognized as designers, and would it be great if a person that promotes high fashion would like to wear “DENZIPFADEN.” But for me it is not so much about a specific person… I think I would be more than happy to be recognized by all the people who love and understand fashion in general. 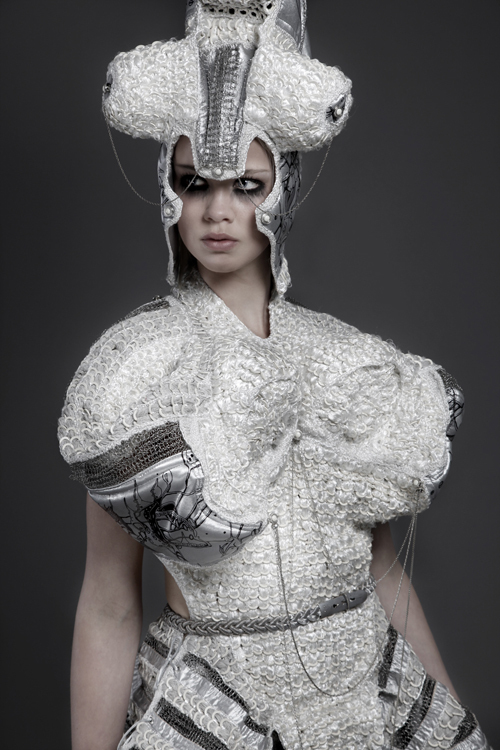 Q: How do you envision the everyday fashion-tech of the future? I think that fashion is something else then just clothes….clothes is a translation of fashion, things we wear in our daily live. If I look at a clothes perspective—I think if we want to integrate it in our daily live, it depends on the people, and on the technology that is being used. People love to wear practical things and integrating technology makes it complex to wear, to wash, iron etc…so it depends on how they translate the endless creativity and possibilities of fashion. Q: Tell us about the piece you developed at Quartier21 during your Artist-in-Residency. The name of the piece is DENZIPFADEN. It is a high fashion men’s outfit that functions as a music/dj controller. The suit and especially the top, is totally handcrafted out of golden silk/polyester wires, and custom made golden zippers that carry the electrical circuit of the suit. By pulling the zippers (6 including the bracelet) up and down the wearer can change the volume of the music or add samples—or anything else from a midi-controller. Our goal was to bring fashion, music, and technology together into a spherical, junglelistic, and dark high fashion men’s outfit. Although the suit is technical, it was designed specifically not to appear that way, making the midi-controller function of the suit secondary to its function as a fashion garment. By keeping the technology hidden, it adds a great element of surprise to the DJ set. Credits: Photographers: Michele Pauty; Igor Kruter; Richard Sinte Maartensdijk; Carina Hesper.